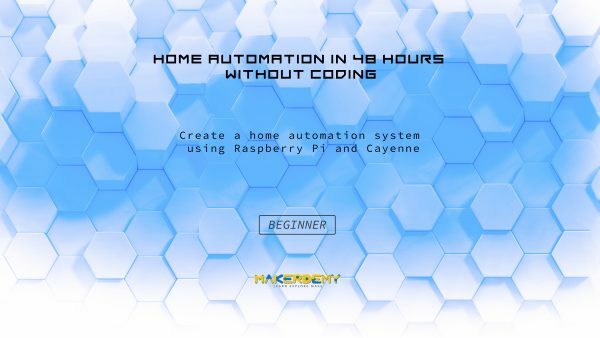 In this course, We will help you explore Internet of things, using Raspberry Pi and Cayenne. Have you ever wanted to build great IoT projects without writing a single line of code? Yes! That’s absolutely possible with Cayenne. Cayenne is the world’s first drag-and-drop project builder developed to quickly design, prototype and commercialize IoT solutions. Cayenne provides a digital dashboard to control and monitor your project from anywhere. You can Quickly connect to the Internet and hook up sensors, actuators, and extensions in minutes. In this course, you will learn to interface sensors and actuators with the cayenne web application after which we will build the Home Automation project. You will learn to control the different home appliances using the cayenne web application or with the mobile app. Whether it is a television, a lamp, a fan or even an AC motor, each one of these can be turned ON or OFF with the help of a smartphone from anywhere in the world. Next, you will also learn to use a digital motion sensor and deploy it for a security alert while you are away from your home. You will get notified by an email as well as a text message if something goes wrong. You will also learn how to read analog sensors using Raspberry Pi without writing lines and lines of code to convert analog signals to digital signals using ADC ICs. You just need to design the circuit, and the system will be smart enough to establish an connection with the circuit. Lastly, you will learn to save energy by building an automatic garden lighting system. A simple light switch is the traditional way to operate garden lights. However, it is sometimes easy to forget to switch the lights on or off. With a simple switch, you also have to bear in mind that darkness falls at different times throughout the year. So, the idea is to turn on the lights only when it is dark. This can save energy and eliminate manual effort. A light sensor can switch on outdoor lights when the light intensity drops below a certain threshold level. When the sky clears up, the sensor will turn off the lights. All the projects will be discussed step by step and with real-time demonstration of the output. If you face any technical issue during the development process, please post your query in the udemy discussion forum. We will get back to you within 48 business hours.